This month, we are celebrating beginners in the IT Security field! For this reason, we are offering all aspiring penetration testers a free PTS training course in Elite Edition with every enrollment in the PTP training course in Elite Edition. With the goal of helping you become a professional penetration tester, we’re introducing our Beginner Month. This month is a chance for you to take a first step into the world of red teaming, penetration testing, and climb your way up to a more professional level with our best-selling training courses, PTS and PTP. 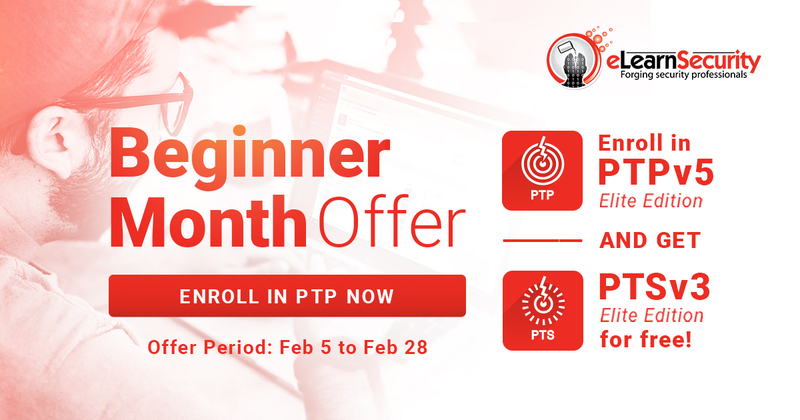 Indeed, this February 2019 exclusively, we are offering a free PTS training course in Elite Edition with every enrollment in the PTP training course in Elite Edition. Discover these 2 courses below. The Penetration Testing Student (PTS) training course is the complete beginner’s course. It teaches you Networking and Programming skills up to the most important basics of Penetration Testing. It’s a perfect first step into the world of penetration testing, both theoretically and practically. At the end of this training, you’ll get the opportunity to become certified Junior Penetration Tester (eJPT) and prove your skills as a pentester. An exam voucher is included in Full and Elite Editions of the PTS course, along with lifetime access to thousands of course materials and hours of practical lab scenarios. The Penetration Testing Professional (PTP) training course takes you from a junior to professional level, and teaches you all the skills modern penetration testers need to know. How? Simply by giving you access to the exact same training materials currently used by the most important security companies and many of the Fortune 500 companies to train their IT Security teams. By following this highly practical course, you’ll learn the necessary skills and techniques to ensure that your organization’s Network, Web Application/s, WiFi and System/s are secure from bad actors. Upon completing this highly-practical course, you’ll get a chance to become certified Professional Penetration Tester (eCPPT) and prove that you are an advanced pentester. An exam voucher is included in Full and Elite Editions of the PTP course, along with lifetime access to thousands of course materials and hours of practical lab scenarios. By embarking in this 2 training courses journey, you’ll get from an entry-level up to a more advanced and professional penetration testing level. This PTS + PTP combination is perfect for you to gain confidence too. Indeed, with the real-life lab scenarios provided in each course, you’ll be fully prepared to work as a Penetration Tester by the time you become an eCPPT. Click here to enroll in PTP. Not yet sure this course is right for you? Try out the Penetration Testing Professional (PTP) training for free before enrolling. Is eLearnsecurity ever going to package PTP with PTX, WAPT with WAPTX, PTP with WAPT, or PTX with WAPTX? Nothing is announced yet for those courses to be ‘bundled’ together.